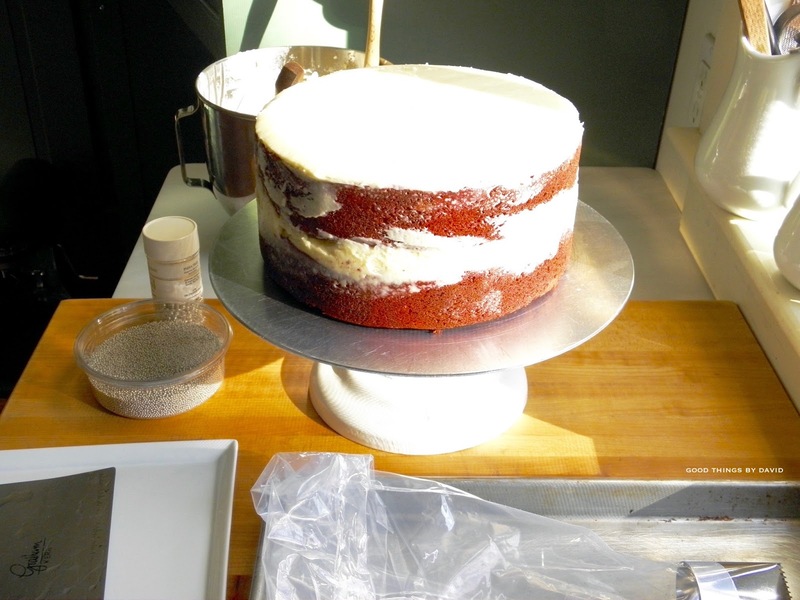 If you're looking for a special cake to bake for a celebration, try making a red velvet cake. It's the perfect cake for a birthday, but it's also great for the winter holidays because of its hue. Think Christmas parties, a Hanukkah feast or a get together with friends and family. I've made this batter on numerous occasions as cupcakes, but I only recently started using it for cake layers and shapely bundt cakes. 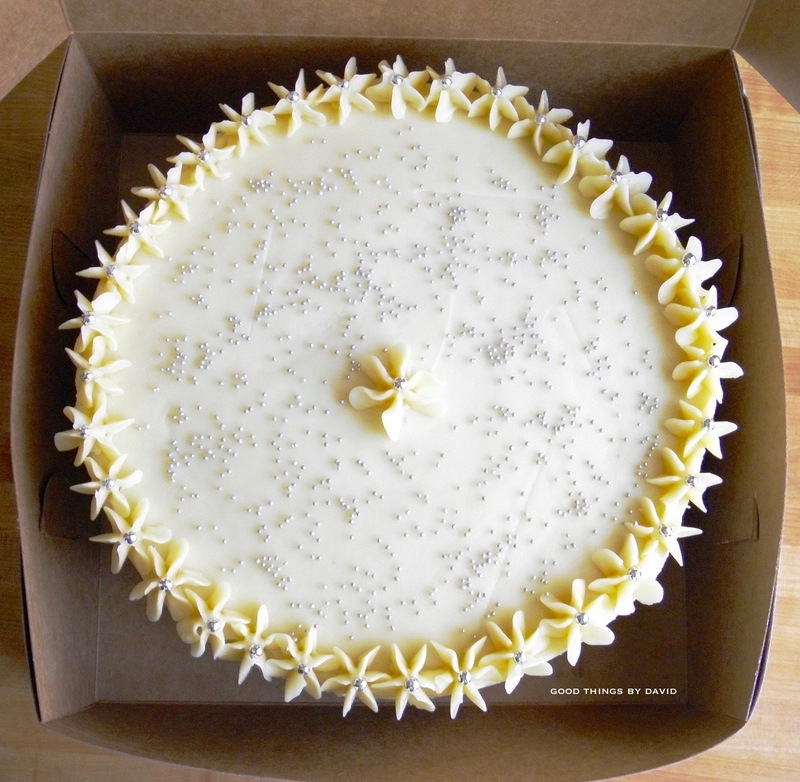 Paired with either a classic cream cheese frosting or a Swiss Meringue Buttercream, the cake is bound to become a favorite with you. You can even make a simple milk glaze if you want a decadent bundt cake. Rather than writing a long, detailed post, I thought I'd show you a few photos of what the layers look like on my cake decorating turntable, and then give you a link with a printable recipe so that you can make one in the coming weeks. Easy! You can see how wonderful the cake layers look as they are being given a crumb coating of my Perfect Swiss Meringue Buttercream. If you're making this recipe for someone special and want to surprise the recipient, bling out your cake by adding different-sized French dragées throughout the cake. I love the combination of large dragées and minis. 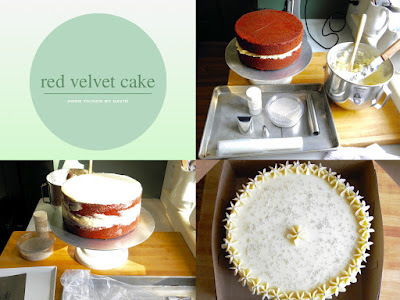 As you can see, this isn't the typical Southern style red velvet cake, but it is nonetheless just as delicious and outstanding. Sounds delicious and I know we would love it. Thanks for the recipe! It is delicious. :) I hope you try it!